With file sending, agents and visitors can add screenshots and other relevant files directly to a chat from the dashboard or widget. Later, a link to the file and its thumbnail appear in History for the chat. The size limit for files is 20 MB. Administrators can also choose to whitelist other file types in additions to the ones listed above. For more information, see Managing file sharing. Visitors to your site can follow these steps to share files with agents. Drag and drop a file into the chat widget box. Alternatively, you can select Options > Send a File and select the file. Wait for the file to upload to the chat. At this point, the file appears in the chat transcript and in the agent's dashboard. The following steps describe how an agent can share a file in a chat. 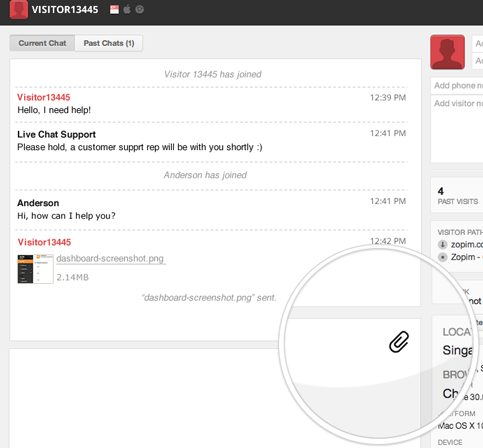 Drag and drop a file onto the chat panel. Alternatively, you can click the paperclip icon in the lower right-hand corner of the chat panel and select the file. The file appears in the visitor's widget. Is there any way to send image attachment via REST chat api? The Chat REST APIs are not designed to support ongoing chats, they focus on past chats. We have no immediate plans in the next 6 months to offer APIs to trigger actions during an ongoing chat. Can you walk me through the use case you are trying to support? Do you mean it's impossible for make a realtime-chat with Zendesk REST API and websocket right now. 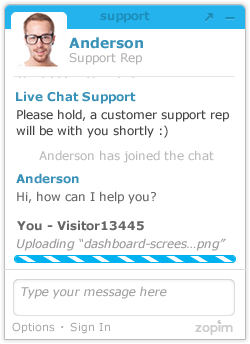 can support live-chat? Can it? Also, I also notice other API clients here: https://developer.zendesk.com/rest_api/docs/api-clients/introduction. Can these API clients support live-chat ? The streaming API is designed for reporting of real time data in aggregate, not to do certain actions in a specific chat. Currently, there are no API clients that support the Chat REST APIs and the clients listed on that page are for the Support product only. Is there a way to only enable File Sending from the agent point of view and not as a visitor? Web SDK is only available to customers on the Enterprise plan and requires development work on your end. How can we enable file sharing option in chat sample provided by zendesk for android platform? This would be for visitors. @Vivek it should be there in sample app automatically. If it doesn't work, try turning off and on file sending in your account as an admin and reload the app. If you are still having trouble, please email chat@zendesk.com and we can troubleshoot further. I need the same than Ellen. I am creating an APP to send files from an image bank. But i can't find a way to do it through API. There is a way to send a picture? The apps framework currently does not have an API endpoint to send files or images. For now, you might need to send the URL to the file from the image bank app instead of the file itself. There are no plans in 2018 to add an attachment API to the Chat apps APIs. can we send file using conversation API ? Currently, there is no API to trigger a file sending event using the Conversations API. Hi, so image sending is not possible at all in Conversation API ? Correct. At this time, it isn't supported. What is the syntax for sending messages to the visitors? 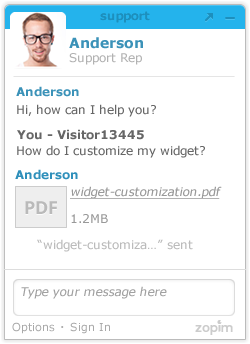 Can you email chat@zendesk.com so you can get assistance with the conversations APIs? Thanks.